Now if you're a true Disney fan then you know who Carl Barks is. And if you've been reading this blog for very long you should definitely know who he is since I've posted a few things about him over the past year. For those new to this world of Disney Geekdom, Carl Barks is the most famous Disney comic book artist... he started work at Walt Disney Productions in the animation department, but then started drawing Disney Comics and made some of the best stories concerning Donald Duck. He essentially created a lot of the mythology that revolves around Donald... from his home town of Duckburg to his foul relatives. One of these relatives is his greatest creation: Scrooge McDuck... one of the most popular Disney Comics characters and later in the late 80's/early 90's the star of his very own show "Ducktales", which was based on Carl Barks stories. Whew... that was a long set-up for something that is not about Carl Barks. Anyway, Carl was irreplaceable... no one could take his place and certainly, no one could equal him. Now for the longest time Disney fans held this as one of the self-evident truths of Disney lore. Back in the 80's along came an artist by the name Don Rosa. Don not only drew great, highly detailed art for his stories, he actually wrote the stories as well. And they were not good stories... they were great stories. Barks himself would have been proud. It seems no one was as much of a Carl Barks fan as Don Rosa was... he could quote you from specific issues and had every story, every character down pat. Over the last decade his stories have earned him a very loyal following amongst Disney Comic Book fans(his largest following is in Europe). It's widely felt that the successor to Carl that never could exist actually did! So who is Don Rosa? Gioachino "Keno" Don Hugo Rosa was born in Louisville, Kentucky on June 29, 1951. An extremely talented comic book writer and illustrator known mainly for his stories featuring Scrooge McDuck, Donald Duck and other Disney characters. Don started working for Gladstone Publishing in the mid 80's after editor Byron Erickson received a phone call from Rosa asking to draw comics for them. Erickson told him send a story and he'd see if it was good enough for publication. Not thinking much else about it, Erickson went about his work until the day the story arrived that Don had written and drawn featuring Uncle Scrooge. The skeptical editor opened up the envelope and read the story Rosa had sent. It was a tale called "Son of the Sun" and the editor was amazed. Elated even at reading this fresh, smart and entertaining story from someone out of nowhere. Needless to say, he published it. The story became a huge success and was nominated for a Harvey Award. 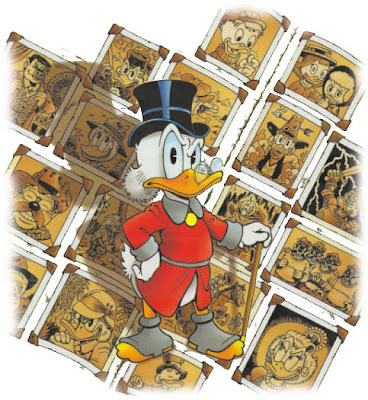 Eventually Don stopped working for Gladstone because of creative differences, but as luck would have it he found work writing and drawing stories for the Dutch publisher Oberon, the publishers of an American Disney children's magazine called DuckTales (based on of the animated series) . He didn't work for them for very long and left soon after over financial disagreements. Eventually, Rosa was contacted by Danish publisher Egmont, who had been publishing reprints of his stories. They wanted more of his stories. Thankfully for them, Don wanted to write and draw more of his stories as well. He joined Egmont in 1990 as a freelance writer/artist and has had a successful relationship with them ever-since. It was just after joining Egmont that he started work on what was to be his most famous work: "The Life and Times of Scrooge McDuck", a twelve chapter story featuring his favorite character, Uncle Scrooge. The series was extremely successful and won an Eisner Award(the Oscar of comics) for best continuing series in 1995. If you've never read this series and are a Disney Geek or fan... shame on you. Go out and purchase a copy right away. Eventually the success of this series spawned a sequel known as "The Life and times of Scrooge McDuck Companion". Unfortunately, Egmont didn't want any additional chapters so the French publisher Picsou picked up the initial run and Rosa started freelancing for Picsou as well as Egmont. Don Rosa still writes and draws stories for Egmont to this day. Fans of his work look forward to each and every new issue that comes out. Although he is mildly popular in America, he is highly regarded in Europe by Disney fans across the continent. Slowly, he is achieving more notoriety here in the States and his stories and artwork are prized possessions for Disney Geeks everywhere. Take a break from your normal routine tomorrow and go into a comic-book shop. Ask the large man with the long hair and goatee behind the counter if they have any issues of Don Rosa there. If he's worth his salt in terms of having knowledge of Disney Comics, then he'll direct you to the Disney section and let you fall in love with with Uncle Scrooge all over again. I am truly sad every time I go to Disneyworld or Disneyland to find a complete void of Scrooge McDuck merchandise. Sadly, most mainstream comic stores have little knowledge of Rosa and even less inclination to carry any of his back issues or collections. You'll have better luck ordering them directly through Gemstone Publishing or even through Amazon and B&N. Thankfully Gemstone continues to reprint his material. Don is a great guy. I've had the pleasure of meeting him a number of times, most recently at this years Heroes Con in Charlotte, NC. Thanks for a great post on one of the best comic book artists around. I wish more Disney blogs would write about Disney comics. Disney is the largest publisher of children's magazines and comics (excluding manga) in the world. Disney's comics and magazines are published in 85 languages in 75 countries. Walk into any grocery store, magazine stall or book store in Europe, and you will find piles of different Disney periodicals, pocketbooks and comic albums. They are a part of life here, and many families have a subscription. In Germany, for instance, nearly one million kids read Micky Maus magazine every week! In Italy summer specials sometimes drive sales of their Topolino magazine to over one million copies per week! If you put that in perspective with the US (population-wise), Topolino does better than Time Magazine or Sports Illustrated. Rosa did write some stories in the 1980s for a Dutch publisher, as you wrote, but Oberon didn't just publish DuckTales comics, they published many comics, including several Disney periodicals and comic books in the 1970s and 80s, one of which is the Donald Duck Weekly, which has been published in the Netherlands since 1952 (it currently has a printrun of about 350,000). I believe Rosa did only two stories for the French publisher, but those were not new chapters of the Life of Scrooge series. He did do a lot of pin-up posters and other artwork for the French monthly magazine Picsou that were based on the Life of Scrooge. The downside of Rosa's popularity (especially in Europe) is that he is requested to do so many posters, calendars, artwork, fan drawings and articles (to accompany reprints of his stories) that he has little time left for creating new stories. That's a shame. By the way, the drawing of Scrooge at the top of your article is not by Don Rosa. scrooge is the finest charecter of the comics medium and don rosa is doing barks proud! i love what he's released so far, me and my pals at the comic shop would go so far as to say that rosa is penning the best comic books ever published. It is unless the Life & Times collection is lying. I noted with happiness that you mentioned that Rosa continues to write and draw right up to this present day. If that is so, why are we not seeing any of his work being published in the US? I see nothing of his work - not even comments about more current work for foreign publications - and I feared that he had stopped. What specific news do you have of his 2006-2008 work? The present illustration in top of this article is indeed drawn by Don Rosa. It is the cover drawing for his "The Life and Times of $crooge McDuck" series. Don wrote the manuscript for one DuckTales-story "Back in Time for a Dime!". The story was drawn by someone else. "Lo$ 10b - The Sharpie of the Culebra Cut". In 2007 Egmont published 12 posters drawn by Don to celebrate $crooge's 60th anniversary.